GATHER THE best pool players from around the world, shake 'em up in a 256-player bracket and what do you get? A third-round match with Lee Vann Corteza, one of the Philippines' best, facing Thorsten Hohmann, a member of Europe's tip-top in talent. At the 2010 U.S. Open, Corteza had the best of this race to 11 from the start. The spindly shooter had an early 5-2 lead when this shot offered a road bump in his runout. Corteza didn't have much going for him with position on the 3 ball, with a cross-side bank perhaps his best bet. But after he dropped the 2 ball in the top right corner, Corteza saw the cue ball stop a bit short on its journey down-table. A 9-baller's first instinct, one shared by commentators Jim Wych and Danny DiLiberto, should've been ducking. With the cluster of balls in the bottom corner, a hiding space wasn't impossible. But Corteza had big plans... or at least two plans. With an unusually feathery stroke for a bank, he sent the 3 ball heading straight for the side pocket. Not only that, the cue ball rolled perfectly off the long rail and into the 7, squarely hitting the 7 ball into the corner pocket. The cue ball then meandered off the bottom short rail and into perfect shape for the 4 ball. 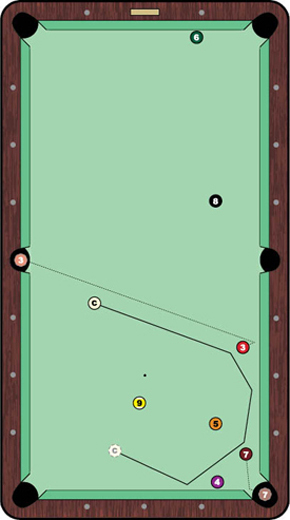 By dropping the 3 and 7 (the latter of which was troublesome for the 5 ball), Corteza opened up the table for an easy clearance that gave him a 6-2 lead. He took the next game for a 7-2 advantage. While Corteza showed his creativity with this particular shot, Hohmann then responded with authority. He took the next nine racks for an 11-7 comeback victory. Not only that, he limited Corteza to three trips to the table, none of which ended in ball meeting pocket.